We're excited to help create an environment for you to discover new hobbies, set and achieve new goals, and establish lifelong friendships. Our commitment to you also recognizes the importance of comfortable, personalized surroundings. 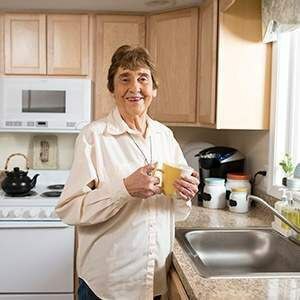 As a Continuing Care Retirement Community (CCRC), we offer a host of maintenance-free living options to fit your preferences—from floor plans to meal plans to monthly service plans and more. We offer studio, one-bedroom, one-bedroom with den, and two-bedroom apartments as well as one-bedroom, one-bedroom with den, two-bedroom, and two-bedroom with den patio homes. In addition, our residential living accommodations include options for a screened porch, sunroom, deck or patio and come with basic cable TV hookup, electric, heat, and water. Because we want you to live your life your way, you’ll have complimentary design assistance in our Design Center, including space planning and furniture-to-floor plan consulting. You can also have any of your interior upgrades managed by our Design Center. From studio accommodations to one-bedroom and one-bedroom with den options, your new studio or Manor House apartment will welcome you in style and comfort. Our patio homes are a great option for those seeking that single-family home style and feel. Offering one- and two-bedroom options, as well as a two-bedroom with den, your new patio home is just waiting for you to move in. "We love Glen Meadows because of the people – we have a lot of good friends here. We like the comfortable size of the community, the beautiful grounds. We love being in the Glen Meadows chorus!"